Metabolic alterations due to IDH1 mutation in glioma: opening for therapeutic opportunities? Recently heterozygous mutations in the active site of the enzyme isocitrate dehydrogenase 1 (IDH1) were discovered in glioblastomas . In cohorts of glioma patients the IDH1 mutation appeared to be a strong predictor of clinical outcome, overruling histological malignancy grade . IDH1 is an enzyme of the tricarboxylic acid (TCA) cycle and is located in the cytosol, where it produces NADPH by transforming isocitrate into α-ketoglutarate. Because the mutant enzyme displays neomorphic activity through NADPH-dependent transformation of α-ketoglutarate into 2-hydroxyglutarate (2HG), the tumorigenic role of the increased levels of 2HG has become a target of speculation . IDH1 mutation alters the cellular metabolism and epigenetic phenotype influencing cellular proliferation. IDH1 mutation infers increased levels of D2HGDH leading to the inhibition of DNA and histone demethylating enzymes, resulting in the glioma-CpG island phenotype . Altered concentrations of pyruvate kinase M2 play also a role in histone modifications which are associated with the transcription of the proliferation-related cyclin D1 and c-MYC . In addition, IDH1 mutant cells show alterations in glutamine, fatty acid and citrate synthesis pathways, which all may have their influence on cellular proliferation . The changes in IDH1 function affect the glucose metabolism, which may explain the different biological behaviour of tumors with and without the IDH1 mutation . In order to detect these changes, we compared the expression levels of the genes participating in the TCA cycle and in the anaerobic glycolysis in 33 IDH1 mutated samples (3 astrocytomas WHO grade II; 6 astrocytomas WHO grade III; 4 glioblastomas; 9 oligodendrogliomas WHO grade II; 11 oligodendrogliomas WHO grade III) and in 39 IDH1 wild-type glioma samples (10 astrocytomas WHO grade III; 26 glioblastomas; 1 oligodendroglioma WHO grade II; 2 oligodendroglioma WHO grade III) and in four samples of normal brain (Table 1). We found expressional differences of 16/24 genes (Figure 1). The IDH1 mutated cells seem to compensate for the low production of α-ketoglutarate by overexpressing D2HGDH and L2HGDH in the cytoplasm. They also overexpress GLUD1, which converts glutamate to α-ketoglutarate inside the mitochondria. In addition, we found that IDH1 mutated cells overexpress HIF1AN. The HIF1AN gene inhibits HIF1α. Since HIF1α acts as an oxygen sensor that promotes angiogenesis, the formation of dysfunctional tumor vasculature is counteracted in IDH1 mutated cells. Furthermore, the IDH1 mutated cells overexpress the LDHB gene while cells without IDH1 mutation overexpress the LDHA gene. 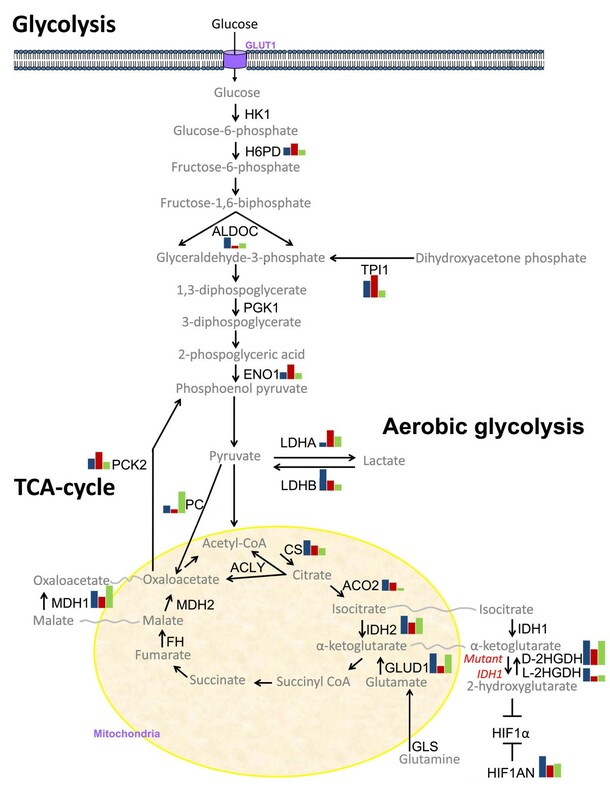 The present results illustrate that tumor cells without IDH1 mutation switch their energy production from a low rate of glycolysis followed by the TCA cycle to a high rate of glycolysis followed by aerobic glycolysis (LDHA up-regulation; Figure 1). The resulting lactate acid production causes tissue acidosis known as the Warburg effect. In invasive cancers, the pH of the extracellular space increases the infiltrative potential of the tumor cells . In addition, normalization of the extracellular pH by alterations of the enzymatic actions of LDHA and LDHB influences the progression of cancer cells [8, 9]. It may well be that glial tumor cells with IDH1 mutation tend to correct their energy production through the TCA cycle by overexpressing LDHB (Figure 1). By doing so, they normalize the tissue pH which offers yet another explanation for the less aggressive biological behavior of the IDH1 mutated gliomas. Legends: A II low-grade astrocytoma (WHO grade 2), A III anaplastic astrocytoma (WHO grade 3), GBM glioblastoma (WHO grade 4), O II low-grade oligodendroglioma (WHO grade 2), O III anaplastic oligodendroglioma (WHO grade 3). Overview of alterations in glucose metabolism in the IDH1 mutated and IDH1 wild-type gliomas relative to glucose metabolism in normal brain. The enzymes included in the analysis are shown in black. The bar diagrams show the averaged expressional levels of genes that were significantly differently expressed in the IDH1 mutated gliomas (n = 33, blue bars on the left); IDH1 wild-type (n = 39, red bars in the middle); and normal brain (n = 4, green bars on the right). Glycolysis leads to the production of pyruvate. In normal brain, pyruvate is converted to acetyl-CoA, which enters the TCA cycle in the mitochondria. But in the IDH1 wild-type tumors, pyruvate is metabolized to lactate (“the Warburg effect” in which the aerobic glycolysis serves as a quick energy source that results in tissue acidosis). To ensure the origin and quality of the tissues, all tissues were assessed by a qualified pathologist before isolation. IDH1 status was checked using IHC and the standard PCR test. Total RNA was isolated with the RNA-Bee (Campro, Veenendaal, The Netherlands). cDNA was prepared using the RevertAid H Minus First Strand cDNA synthesis kit (Fermentas, St Leon-Rot, Germany). The resulting cDNA preparations were analysed by real-time PCR with SYPR green master mix solution (Applied Biosystems, Nieuwerkerk a/d IJssel, The Netherlands). PCRs were performed in a 25 μL reaction volume in an Applied BioSystems 7900HT Fast Real-Time PCR system. Negative controls included minus RT and H2O-only samples, which were negative in all cases. Expression of B2M, HPRT1 and PBGD was used as a reference to control sample loading and RNA quality. Differences in mRNA concentrations were determined using the t- test, with P < 0.01 being considered statistically significant. All statistical tests were two-sided. We conclude that gliomas with IDH1 mutation normalize their glucose metabolism, which appears to result in a slower tumor progression. Depending on the IDH1 status of the tumor, specific interference with the glucose metabolism and aerobic glycolysis should therefore be considered for future therapeutic strategies. The authors thank Mr. M. van der Weiden for his technical assistance and Mr. F. van der Panne for assistance with the photography. DM and LB carried out the molecular genetic analyses; SS and PvdS carried out the data analysis and DM and JMK conceptualized and designed the study and wrote the manuscript. All authors read and approved the final manuscript.